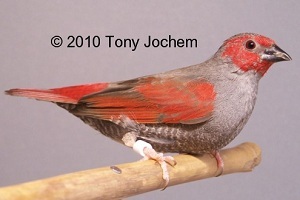 This bird is not formally known as a subspecies, but it is presumably a crossbreed with the Red-winged Pytilia that also lives in the same area. It appears that the yellow-winged species can be split for red-winged. The reason for mentioning this bird is that it is a frequent sight. 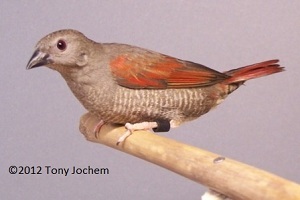 It is identical to the species described above, except that the wing coverts are red instead of golden yellow. 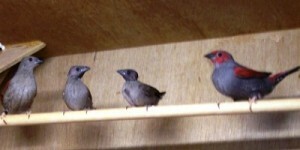 The birds you see here, are cross breeded in my birdroom. 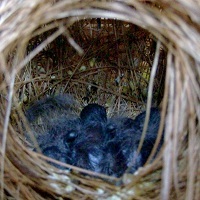 Females are identical at Red-winged Pytilias, but the plumage is more greyish.